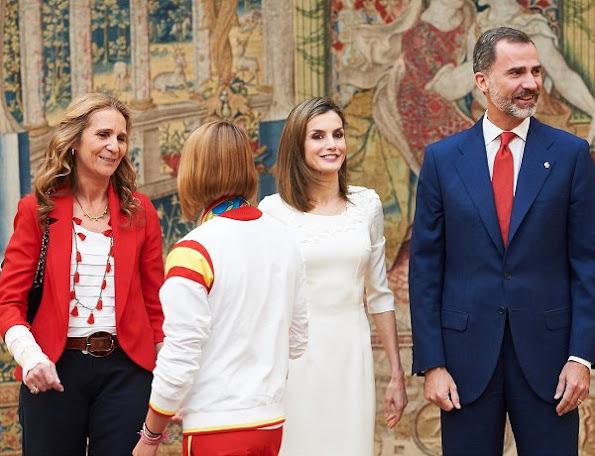 King Felipe VI of Spain, Queen Letizia of Spain and Princess Elena of Spain receive Rio 2016 Olympic and Paralympic medalists at El Pardo Palace on September 28, 2016 in Madrid, Spain. Queen Letizia wore Felipe Varela Dress. Their so called atypical vacations are over,so now they are trying to amend...Shame on them!Spain definitely deserves better representative. Well, I think they are actually doing this king-queen business pretty well. I understand anyone can have aversions to a certain person (probably to a king, queen, prince or princess on this site), heaven knows you might even be right but next time could you please work your opinion into some kind of sartorial context? Really, I think even a point on comment on the price tag of some of the clothes here can be fair game, don't you think guys? You could have said something like "doesn't matter what she wears, she can't make up for failing to receive the medalists right after their return" and that would be more or less acceptable (obviously the previous ones between commas are not my thoughts, to the contrary, I think they probably have tons of engagements to fit this reception between). And now: Queen Letizia is elegant, well coiffed as usual and her jewelry is nice. I wish however that those earrings were a bit more colourful. She has a similar pair in lovely red shades, that would have done the trick. The dress is a pretty piece, although I think the random flower appliques on the Varela pieces are starting to become a bit boring. I love the dress and she looks lovely ! Yup ZL. I like fashion and the red earrings would have helped this blah fashion outing. This is a FASHION site. It is NOT a political site. I suggest you go to some political site that has to do with Spain to spew out your opinions about the monarchy, government, etc. Elena, her sister in law looks good and casual, Letizia is a bit too dress up for the occasion. After all the bad press they got, is good they finally deigned to meet the Olympians. El vestido es del año 2013. Lo estrenó en la visita de los reyes de Holanda y le sigue quedando igual de bien porque su figura es extraordinaria. La mayoría de los españoles estamos conformes con nuestros reyes. Los haters son pocos, pero ladran mucho por todas partes y por motivos ridículos e insignificantes. Estoy completamente de acuerdo. Aunque al principio Letizia no me parecía simpática en absoluto ahora pienso que es buena consorte y una representante ágil y trabajosa de España. Tengo dos amigos españoles que le conocen a través de amigos y la verdad es que dicen que no les cae bien como persona (privada) pero reconocen que hace un trabajo extraordinario, lo que debe ser lo que importa. La gente que habla contra Letizia o la monarquía nunca había tenido que aguantar la serie de personas impresentables, incapaces, iletradas, de mal gusto, de pobre civilidad, de pasado y/o presente político intolerablemente turbio que son los presidentes de mi país y de la mayoría de las repúblicas en Europa. good, I so wish for her that she'll meet somebody again. But what happened to her hand? I am surprised Queen Letizia is letting her gray hair shows. She looks lovely but a bit over dressed for the event. I wish Felipe would get rid of that awful beard!